When you’re in a pinch but want variety, just mix-and-match with a few ingredients to completely transform your meals. 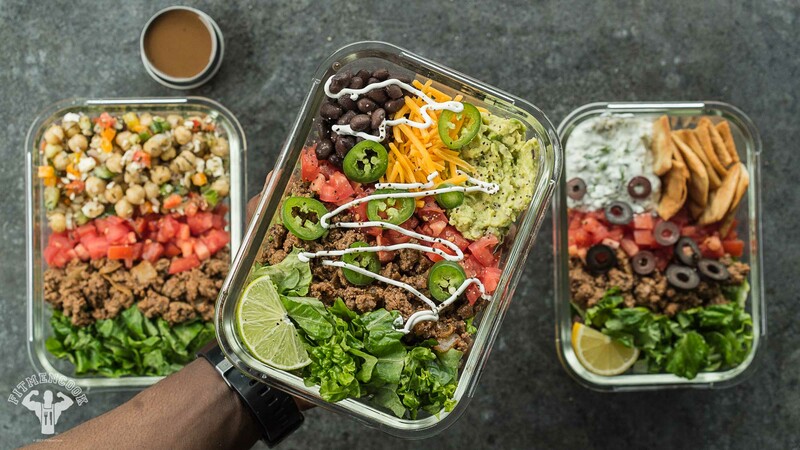 Start out with a base – like lettuce, lean ground meat and tomatoes – then add different ingredients throughout the week! Here we will be teaching you how to prepare super delicious easy lunchbox meals. Spray a nonstick skillet with olive oil and set on medium heat. Add onions and cook until brown, about 3 to 5 minutes. Add lean meat, and chop it up and cook in the skillet using a spatula. Add the seasonings and continue to cook until the meat is no longer pink, about 6 to 8 minutes. Remove from the heat and set aside. Assemble the meal. Add lettuce, a fourth of the meat (or your measured portion) and 1 diced tomato. Then add the remaining ingredients for the Tex-Mex lunchbox. I recommend adding the avocado the morning you’re going to eat the meal AND squirting a little lime on top to prevent any browning. 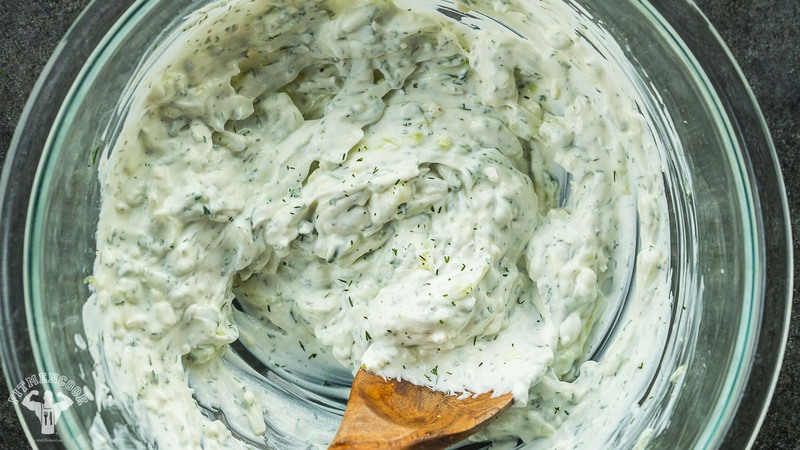 Mix together all of the ingredients for the Tzatziki in a bowl and refrigerate overnight for best results in terms of flavor. Assemble the meal. Add lettuce, a fourth of the meat (or your measured portion) and 1 diced tomato. Then add about 1/4 cup of the tzatziki along with a serving of wheat pita chips or pita bread. You can keep the pita chips/bread in a separate bag so they will not get soggy. Garnish and enjoy! 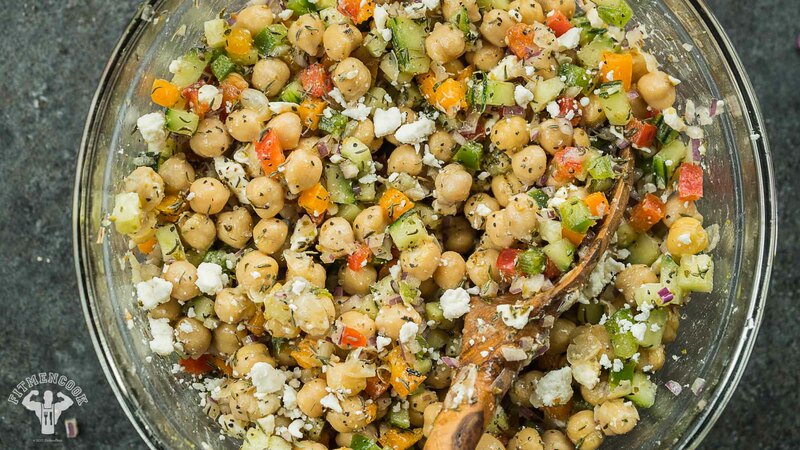 Add all of the ingredients for the salad in a bowl and mix together. Season to taste with sea salt & pepper. Assemble the meal. Add lettuce, a fourth of the meat (or your measured portion) and 1 diced tomato. Add a serving of the salad. Enjoy the salad with your favorite low-calorie vinaigrette.